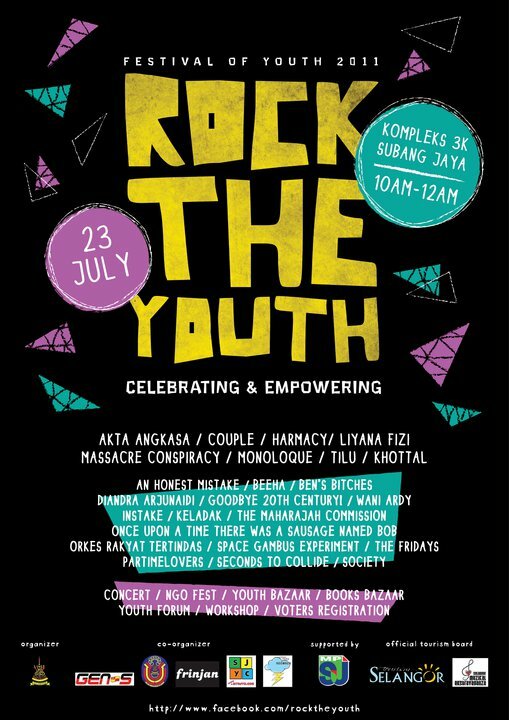 A sort of NGO fest is happening this Saturday, courtesy of the Frinjan gang in collaboration with Gen-S, which aims to educate the youth on current socio-political issues and voting rights but not forgetting to bring on the rock, which they do with an impressively varied line-up of acts including Akta Angkasa, Couple, Harmacy, Khottal, Liyana Fizi, Monoloque, Massacre Conspiracy, Partimelovers, Tilu and loads more, with 24 acts in total. Event starts at 10am on Saturday, 23rd July 2011 at Kompleks 3K, Jalan SS13/1, Persiaran Kewajipan, Subang Jaya (map to the venue HERE). Admission is free. Check out the event’s Facebook page for more info.